(CNN) -- Honduran interim President Roberto Micheletti's hard-line stance against the return of ousted President Jose Manuel Zelaya has softened, he said, but the signing of a proposed agreement to end the country's political crisis remained uncertain. Interim President Roberto Micheletti is reaching out to Costan Rican President Oscar Arias for a solution. In a statement released late Wednesday, Micheletti said an agreement presented by Costa Rican President Oscar Arias "is the best path toward the achievement of consensus in Honduras." Micheletti's announcement was an apparent change of position, given that it was accompanied by a call to Arias to send a special envoy to Honduras to persuade political and business leaders to embrace the agreement, too. In the month since Zelaya's ouster, members of Micheletti's government have repeatedly stated that Zelaya's return is an unacceptable condition. Arias' proposal, known as the San Jose Accord, includes Zelaya's reinstatement as president, albeit with reduced powers. "This is the time for all Hondurans to participate in the building of a consensus that respects our constitution and our laws," Micheletti said. 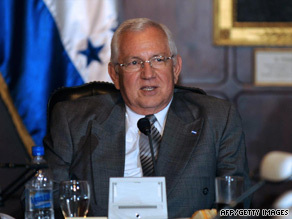 During two rounds of failed negotiations mediated by Arias, the Micheletti camp rejected an initial proposal because of the condition of Zelaya's return. Micheletti's negotiators left open the possibility after being presented the San Jose Accord, but that time the Zelaya camp walked out. After the breakdown of talks, the de facto government said Zelaya's return was on the table, subject to the approval of the different bodies of government, including two Zelaya opponents -- the congress and supreme court. Micheletti's new effort to persuade his backers to accept the accord is a new level of commitment for him. The move is a classic case of negotiation being played out in public, said Christopher Sabatini, senior director of policy at the Americas Society and Council of the Americas. "I think the pressure is being ratcheted up," Sabatini said. "He has got to get other people involved." Micheletti's announcement follows the revocation of diplomatic visas from four of his representatives in the United States. The European Union may follow suit, Arias said at a news conference in Costa Rica, declining to discuss "other sanctions that other countries are considering." Micheletti's recommendation for envoy is Enrique V. Iglesias, former president of the Inter-American Development Bank, Arias said. Iglesias could be an effective envoy because "people roundly respect him," Sabatini said. He was ousted in a coup on June 28. The congress named Micheletti provisional president shortly after Zelaya was detained by the military and sent into exile. Micheletti and his supporters deny that a coup took place and argue that the action was a constitutional transfer of power. On Thursday, the Honduran congress continued speaking with different sectors of society and debating whether it would accept the points of the San Jose Accord. Ramon Velasquez Nassar, vice president of congress, told CNN en Español that while the legislative body considers a political amnesty relating to the events that led to the coup, there would be no impunity for Zelaya regarding separate corruption charges that he faces. An amnesty that covers both sides from their actions surrounding the crisis is a needed step to restore order, Michael Shifter, a vice president at the Inter-American Dialogue, told CNN en Español. "In my opinion, there is not another option outside of what Oscar Arias is doing," Shifter said.